I’d been fantasizing about staying in Antibes since my European backpacking trip with my girlfriends when we made a day trip by train from Nice. This visit lived up to the fantasy and beyond! We rented this fabulous Airbnb beach side apartment managed by the best local host you can imagine. She made her own custom map of Antibes complete with “best rotisserie chicken”, “best gelato”, “best baguette” and on and on… With Fanny’s guidance we ate at all the fabulous local spots and never had a bite that was less than “the best”! I noticed a group of older gentelemen congregating in the park outside our apartment the moment we arrived. It seemed odd, the number of them, together, in the middle of the afternoon, just standing around. 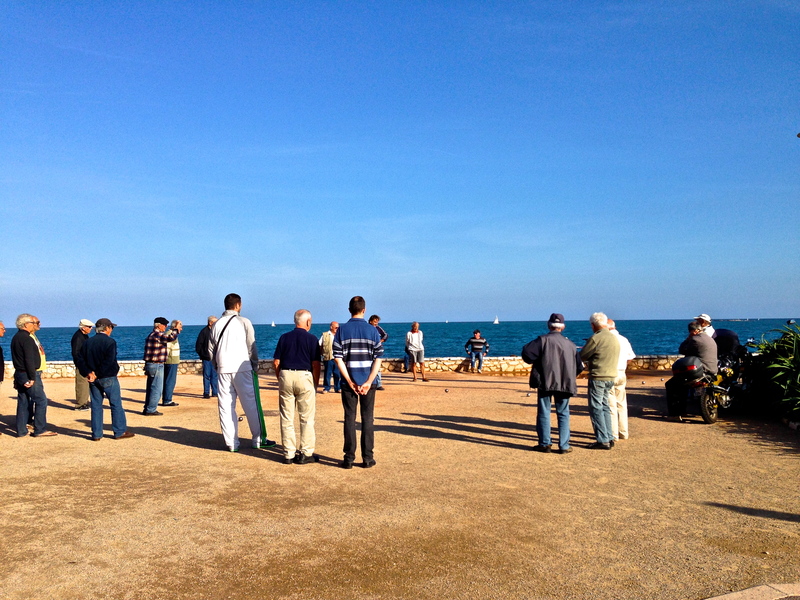 Upon closer inspection I saw they were circled around some activity and then I saw it – BOCCE! The players change throughout the day with a surge around the lunch and happy hour/sunset hours. Sometimes 8, sometimes 20+! There was something in the simplicity of the game, in the community they had formed that moved me. They take their time, they chat between throws, they cheer, they heckle, and they connect. Face to face. No smartphone screens, no cell phone calls. They just are, together, in the sunshine by the sea. In simple, human, connection. Beautiful, isn’t it? Happiness is a fresh baguette! Place to stay: One of Fanny’s properties, we’re partial to our apartment, listed above. Roast Chicken: Cors Massena, just before the market. Local Treat: pissaladière, local pizza topped with caramelized onions, anchovies, and olives. Eat this at Vezziano bakery on Rue des Bain if you can. They also have it at most bakeries that have pizza. Get it to go and take it somewhere lovely. We enjoyed eating it near the storybook carousel. Asian Fusion Dinner: La Cafetérie Félée Eat the crab appetizer in crispy wonton cone rolls. YUM! Farmer’s Market: Main market in old town, can’t miss it before 1pm. Be sure to get the dehydrated fruit and put a dried strawberry in a glass of champagne, decadent! Happy Hour: Sit at Pan e Vino or one of the neighboring restaurants and enjoy a glass of wine while you watch the local men play their daily game of bocce. Sunrise: Also from this little park near Pan e Vino, it’s early but amazing. Or walk the boardwalk from here. Running Route: Start, again, at Pan e Vino and run toward the beach with the sea to your left. You can run as far you want (we went 45 min out) along the coast, sidewalk is safe, and views are lovely. The highlight was the local Farmer’s Market! I could have spent the monthly budget just on olives and tea! We befriended the vendor selling dehydrated fruit: pears, apples, papaya, mango, strawberries (excellent in a glass of champagne! ), and my favorite – ginger! We bought so much that we were still eating it camel back in Morocco two weeks later. Such a treat! He threw in some extra ginger for me, they were so strong I don’t think he sells many! I haven’t noticed any hair on my chest but they pack a serious punch! Two days was not enough. 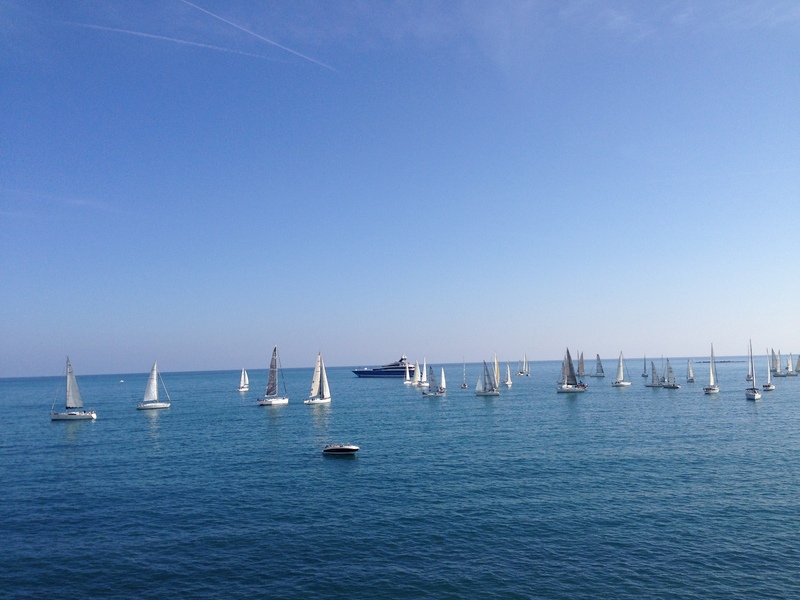 After seeing the insane yachts parked in the Antibes harbor it’s clear we need to make some new friends and arrive by sea next time. Know anyone we should know? As always: love the Blog !! Great plan to find friends with boats! Or we might charter some day…..